1. Prang - moist and easy to get pigments. Color is a bit more saturated than other cheap paints. Student-grade. Tends to attract ants, though. Retails at around Php 230 - Php 400. 2. Dr. Ph Martins Radiant Concentrated Watercolor - very pigment, bright/radiant, and transparent. Ideal for scanning or for artworks which are meant to be printed. Will tend to fade faster than regular watercolours. Not lightfast. Retails at around Php 380 per bottle. 3. Dr. Ph Martins Hydrus - Pigmented as well. Easy to mix since it is liquid already. A bit more opaque than the Radiant Concentrated Watercolor. Archival. Retails at around Php 275 per bottle. 4. Winsor and Newton Artists Watercolor Set - Vibrant, Brilliant. Ideal for traveling since the set has mixing squares. I use this mostly for practice and personal artworks intended for framing. Retails at around Php 3,000. 5. Peerless Watercolors - Pigmented and portable. I use this for journals/urban sketching. Forty colors of awesome paint. One of my faves. Retails at around Php 1,000 for a pack of 40 colors. 6. Rembrandt Artists Colors - Artist grade paint. Rich in colors with maximum transparency. The set is a bit too heavy though. I use this for Final artworks and when I am too lazy to mix since the palette comes with 48 colors. Retails at Php 9,000 for a set of 48 colors. 7. Shin Han PWC - Highly pigmented. Artist Grade. Strong transparency and brilliance. LIFESAVER. These pinks are so easy to use esp. for floral painting. Hoard away. Retails at Php 150 - Php 750 per tube. 8. Shin Han Pass - Very creamy and thick. Rich in pigment. Not that transparent as compared to Korean Colors or PWC since it's a hybrid of Gouache and Watercolor. I usually dilute it with a lot of water to achieve a transparent look. This tube will go a LONG way. Retails at Php 170 - Php 450 per tube. 9. Finetec Metallic Palettes - My favorite gold watercolor of all times. Posted a review here. Retails at Php 1700 - Php 1850 per palette of 6. 10. Zig Kuretake Gansai Tambi - My go-to paint for practice! Pigmented and High quality. Retails at Php 899.75 for the 12-color palette. Most of the brushes I use for painting/lettering are synthetic and can be easily found at local bookstores. I also use round brushes more often than broad or slanted ones. For fine details, it is handy to have a 3/0 or 5/0 paint brush. Note: the brush size will depend on how big you need your artwork to be. Experiment! 1. Kuretake - Fine tip, larger barrel. Bristles are relatively shorter than Aquash but offer more control. Larger barrel means less water refill. Available in Medium and Large tips. Retails at Php 205. 2. Pentel Aquash - Synthetic but offers great control too. I have Small, Medium, and Large tips but I use small tip 95% of the time for lettering or detailing. Retails at Php 300 - Php 350. 2. Holbein - very soft bristles. Bigger water barrel as compared to Pentel. I find this troublesome cause it releases water too much. Retails at Php 350. 3. Sakura - Longer bristles. Not really my favorite but when everything else wasn't available, this was the only waterbrush I had. I load this with fountain pen ink. Retails at Php 220. Mixing palettes come in different sizes. 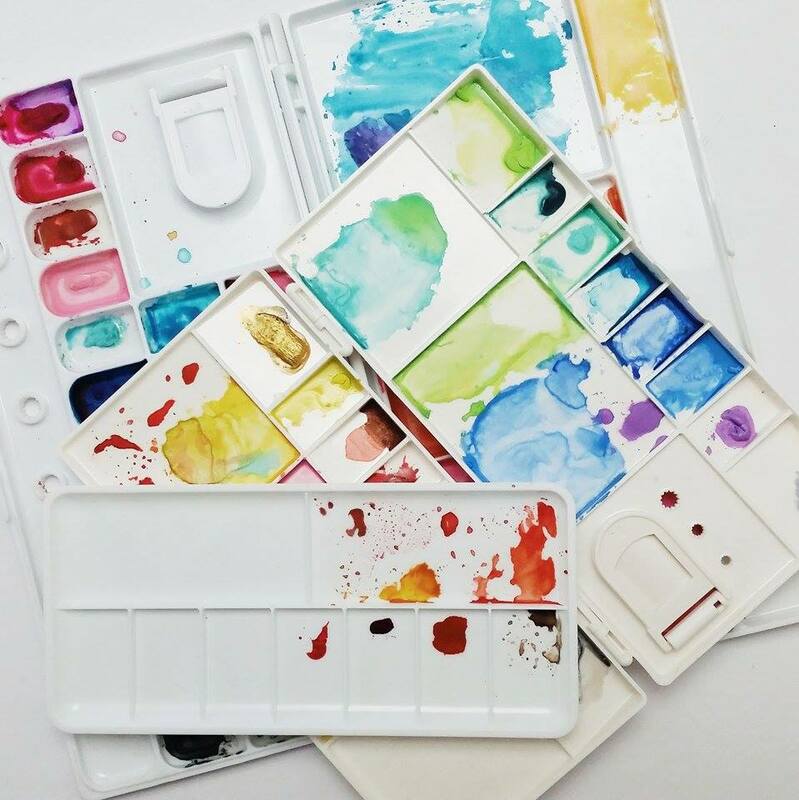 Ideally, for watercolors, you should use the square/rectangle flat ones so as to prevent the pigment from settling at the bottom - which happens for dome or cave type of palettes. These are from Craft Central, Dipnbrush, and Fully Booked. Cold Press paper is a bit rough and gives a more textured look to the artwork while Hot Press is more smooth and ideal for fine or detailed work. For final artworks, best to use 300gsm above and acid-free papers. 1. Canson Montval - 300gsm, Cold Press. Retails at Php 350 - Php 610. 3. Hahnemuhle Britannia - 300gsm, Cold Press. Retails at Php 600. 4. Moleskine Watercolor Notebook - 300gsm, Cold press. Great for urban sketching or if you want to track your progress. Retails at Php 1,300. 5. Potentate Watercolor Pad - 200gsm. Retails at Php 250. 7. Fabriano Watercolor Postcard Set - 300gsm, Cold Press. Retails at Php 2,995+ for a block of 10 sheets. National Bookstore, Scribe Writing Essentials, Fully Booked, Artwhale, Deovir arts, Dickblick.com, Paperinkarts.com, Pensgalore, Craft Carrot, Dipnbrush, The Craft Central, Swirls and Strokes. Feel free to google branches/store locations/products available per store.